Marin Humane is led by an experienced team of big-hearted people. 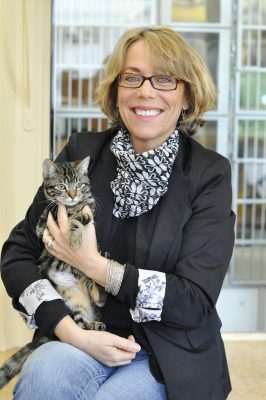 Nancy took the helm of Marin Humane as its Chief Executive Officer in March 2011. 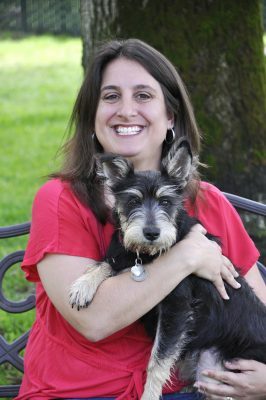 Before the move, she worked her tail off as CEO of Seattle Humane for 19 years (and as their PR coordinator for three), executive director for the Petfinder.com Foundation, interim manager for King County Animal Care and Control, and as a consultant. Nancy is past president of the boards of the Washington State Federation of Animal Care & Control Agencies, the Society of Animal Welfare Administrators (SAWA), and Elder and Adult Day Care Services. 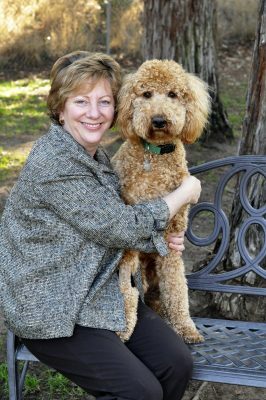 Having held numerous positions on several national, statewide, and local boards and committees over the years, Nancy currently serves on two boards – CVNL (Center for Volunteers and Nonprofit Leadership) and on the State Humane Association of California. She also chairs the CAWA (Certified Animal Welfare Administrators) Test Development committee. Nancy earned her undergraduate degree from Brown University and a master’s degree in Not-for-Profit Leadership from Seattle University. Nancy and her husband Jim currently share their home with two adopted cats, Fiona and Leo, and Marin Humane alum Brody, a Lab-Poodle mix. They’ve always had shelter pets as family members, despite the fact that Jim is allergic to animals. Darlene has been with Marin Humane since 1991, serving in positions in education, adoptions and the behavior and training departments. As director of community engagement, she manages our Pet Care Assistance, Pet Safety Net, Animal-Assisted Programs, and Share a Book programs as well as Humane Education. 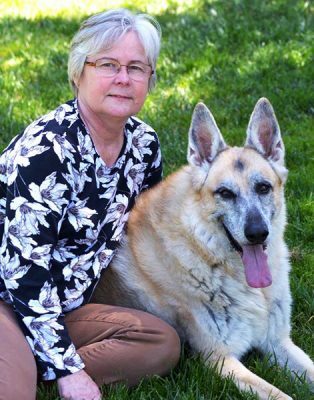 She also teaches the Your Dog to Share and the Share a Book specialty classes, which teaches volunteers about animal-assisted therapy and the human-companion animal bond. 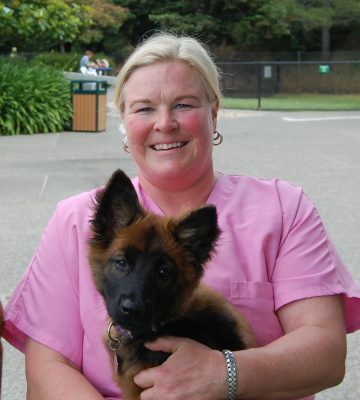 Before joining the team at Marin Humane, Darlene worked for 10 years at the Massachusetts SPCA, starting as an animal care technician at the Angel Memorial Animal Hospital, then farm animal care coordinator, humane educator, and volunteer coordinator. She also worked at the Massachusetts Audubon Society, a farm education center, and at a livestock auction where she worked to create a safer, more humane place for the animals. Darlene graduated from the University of Massachusetts in Amherst and studied animal science/veterinary medicine. Darlene feels blessed to have her dream job which allows her to make a difference for animals and people every day. She lives in Fairfax with her husband, daughter, and three cats Snowy, Fergus, and Wee Mark. Darlene is a card-carrying member of the Red Sox Nation and she enjoys gardening, hiking in the beauty of Marin, reading, and traveling home to New England. 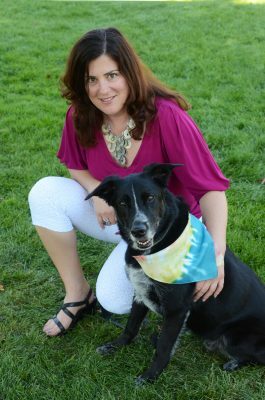 Lisa manages Marin Humane’s marketing, website, media relations, publications, and social media. 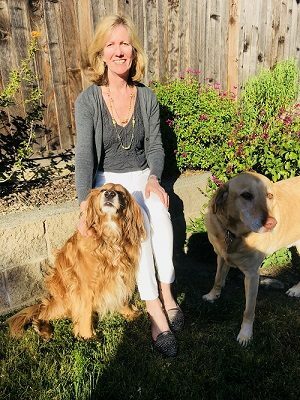 She comes to Marin Humane with more than 20 years’ experience in communications in the nonprofit and public sectors, including Blood Centers of the Pacific, where she served as director of communications. Before that, Lisa worked for the Corporation for National Service in Washington, DC, where she managed communications nationally for the AmeriCorps program. Lisa earned her B.A. degree in Public Communication from American University in Washington, DC, but after too many humid summers, she moved back to her home state of California. Lisa has been a lifelong animal lover and has always had shelter animals. She and her young daughter share their home with a dog named Bowie and two kitties, Magic and Mischief – all Marin Humane alumni. Ashley was thrilled to join Marin Humane in 2016 and manages the Finance Department. She has over 10 years of finance experience from a series of companies in the outdoor and active wear branding and licensing industry. Ashley earned a B.A. in Economics from Williams College and is working towards her C.P.A through the University of California, Berkeley. Ashley lives with her husband and their two energetic dogs (Lucy and Miley) in Novato. They enjoy the beach, hiking local trails, modern and contemporary art, and spending time with their large family. A love of animals and science led Dr. Belinda Evans to become a veterinarian. She graduated from the University of California at Davis Veterinary School and worked in private practice for several years before realizing her passion lay in shelter medicine and helping homeless animals on their way to a better life. 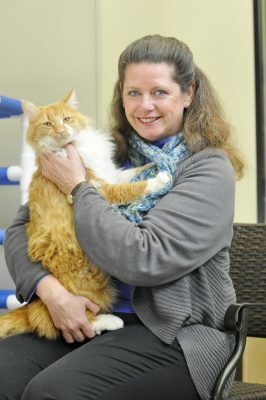 She has been with Marin Humane since 2003 and has helped the shelter veterinary clinic grow, especially in its ability to rehabilitate sick and injured animals. 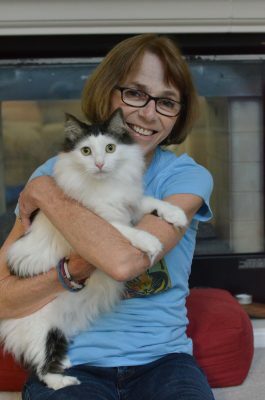 Besides the wonderful staff and volunteers at Marin Humane, Dr. Evans draws support from her very tolerant husband, two Marin Humane alumni dogs, and two private practice-rescued cats. She enjoys travel, music, and the rare good night’s sleep! Keri’s introduction to Marin Humane was in 1998 as a volunteer pet pal. Inspired by the organization’s innovative thinking, Keri transitioned from volunteer to employee in 1999 when she became a Customer Care Representative. Keri’s passion is working with people and in 2005, she was promoted to Director of Customer Care. As the director of Shelter Services, Keri oversees the Adoption and Animal Care departments, as well as the Veterinary Clinic and our campus store, Animal Outfitters. Keri attended Sonoma State University and graduated with a B.A. in Political Science and an M.A. in Public Administration. Keri appreciates the organization’s willingness to think outside the box and to explore new ways to improve the lives of animals and people. She lives in Sonoma County with her husband and two kids, as well as a plethora of shelter animals. She’s known around the office for her love of all things sparkly. Dawn has been an integral part of the Behavior & Training team for more than 15 years. She teaches obedience classes, private obedience sessions, and conducts behavior consultations with a specialization in aggressive behaviors. She also works with shelter animals to assess their behavioral tendencies and make recommendations on their ideal home. Dawn earned her B.A. in Business Economics from the University of California at Santa Barbara and her M.B.A. from the University of California at Berkeley. She and her daughter Cassidy share their home with a Belgian Malinois, one mixed breed dog, one Belgian Tervuren, two cats, and numerous chickens. All of her dogs are titled in the canine sport of Flyball and run with the Marin Running Riot Flyball club. Dawn has also competed in Rally & Competition Obedience and trained in Agility and Schutzhund. 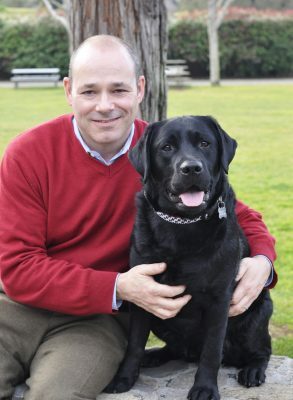 Joe joined Marin Humane as Director of Development in January 2013. He has more than 20 years of development and external relations experience in the nonprofit and university sectors. After working at major universities and nonprofits in New York and Pennsylvania, Joe relocated to Marin in 2006 and has since expanded his knowledge of the Bay Area philanthropic community at leading organizations. Joe earned his B.S. degree at the University of Scranton in Pennsylvania. He shares his home and office with Otis, an exuberant Labrador Retriever, and Gracie, an even more exuberant Golden Retriever, and enjoys traveling, hiking, and culinary adventures. 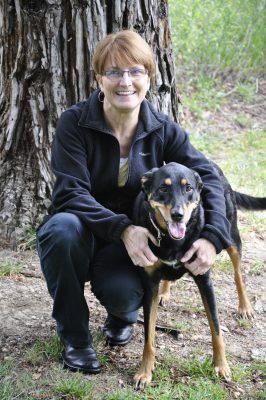 After completing her formal education and specializing in animal sciences, Cindy began her career as an animal services officer with Marin Humane in 1984. In her current position, she is in charge of administering the animal services contract for Marin County and all of its cities as well as supervising the Animal Services division, which includes oversight of the Animal Services officers and the the Customer Service and Licensing departments. She also coordinates and supervises the Basic and Advanced Animal Law Enforcement Academies held at Marin Humane in partnership with Santa Rosa Junior College. Cindy is a member of Marin Humane’s Advocacy Committee and enjoys educating the public on a multitude of topics that inspire compassion for all beings. Cindy is routinely called on for her expertise in animal issues around the country including animal cruelty/neglect, animal and human violence issues, captive wildlife, animal hoarding, legislation, and other serious animal-related investigations. Cindy lives in Sonoma County and in her spare time she’s a master mixologist. Anne Oliver began her career at Marin Humane in March 1990 in the Customer Care department as the licensing assistant. Later, Anne was promoted to customer care supervisor and eventually became the director of customer service, overseeing the front office and the Adoption department. She was instrumental in raising the level of customer service in her departments and shelter-wide. In 2005, Anne took on a new position – volunteer coordinator. Within a year, she was promoted to director of Volunteer Services. Anne manages the Volunteer Program, which engages 700 adult volunteers. She’s also an active member of the Customer Service Implementers team and facilitates customer service workshops for staff and volunteers both at Marin Humane and shelters outside of Marin County. Anne has been an animal lover all her life with a special fondness for kitties. She and her husband, Al, share their home with three – Sammy, Benny, and Hobbes – and a red-eared slider, Gizmo. She has two grown children who also love felines and have cat companions. Anne has been a vegetarian for 35 years and a certified yoga teacher since 2008. She teaches regular yoga classes to staff at Marin Humane and in the community. 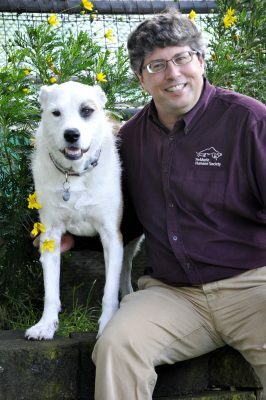 John joined Marin Humane in 1994 as an animal services officer after serving as the Special Events Coordinator for UCLA. His gift of gab saw him move to the Public Relations department in 1998 and a year later, he became the director of that department. In 2003, John was appointed Chief Operating Officer, overseeing several community service departments. In 2007, he led the effort to build two dog parks, a fountain plaza, and expanded parking. And more recently, he orchestrated the construction of the Intake Center and complete renovations of the cat and dog adoption areas. In 2015, John managed the build out of Marin Humane’s first satellite center, Kitty Corner. That same year, he became the Chief Administrative Officer, overseeing Behavior and Training, Facilities and Maintenance, Human Resources, Information Technologies, Master Planning, Training & Compliance, and Volunteers. John earned his B.A. degree from UCLA. His life is fuller when enjoying live music, cycling, kayaking, and Marin outdoors. He shares his life with an adorable daschund-spaniel mix, Owen, two gregarious cats, Bradley & Sheldon, and his wife Andrea, a registered veterinary technician at Marin Humane. Valerie began her career at Marin Humane working in the Customer Service department and after two years was promoted to licensing coordinator. In this later role, Valerie oversaw a significant increase in dog license revenue for the County. In 2005, she moved to the Finance department to fill the role of accounting and human resources clerk. Valerie particularly enjoyed interacting with staff as a member of the Finance/HR department. In 2008, with the number of full and part-time employees topping 95, Marin Humane realized the need for a dedicated human resources manager and Valerie was a natural fit for the position. Now the director of human resources, Valerie offers support, guidance, and resources to the dedicated staff. A lifelong cat lover, Valerie became a foster mom to an adoption dog that said “no way” to spending time in the kennel while she was awaiting adoption. “Foster mom” turned into “forever mom” and now Valerie happily shares her home and life with Emma. Valerie enjoys spending time with family and friends, music, film, reading, and the first days of spring. 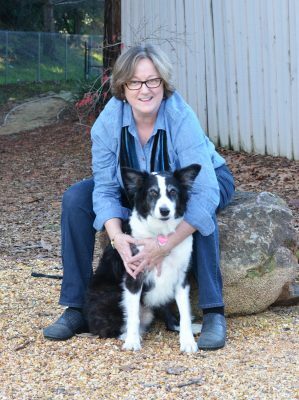 With a lifelong commitment to animal welfare, Kim has devoted her career at Marin Humane (more than 34 years!) to creating innovative programs. In 1982, she started her career as an animal care technician, then transferred to enforcement in the field as an animal services officer. In 1990, Kim became the director of animal care and veterinary services. In this role, Kim developed the Foster Care and Pet Partnership Programs, both of which are integral to the success of Marin Humane. Kim brings her impressive organizational abilities to Marin Humane, along with her gift for data collection and resource allocation. She is also responsible for the on-boarding and training of new employees. She is most proud of her work helping those in the animal welfare field deal with compassion fatigue. Kim attended attended College of Marin where she studied sociology and Santa Rosa Junior College where she studied criminal justice. Kim and her husband Paul have a grown son, Chris, and daughter Meghan, and are kept on their toes by two active German shepherds, Rocky and Cheyenne, and a cat named Mister.